This is the total number of profanity incidents in this 307 page book. 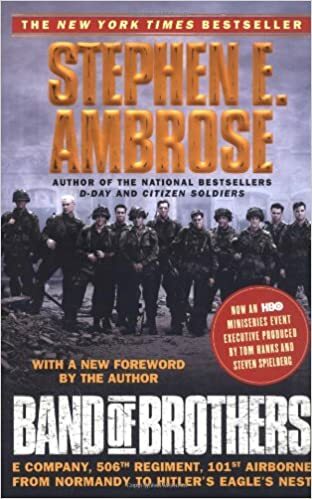 Stephen E. Ambrose’s iconic story of the ordinary men who became the World War II’s most extraordinary soldiers: Easy Company, 506th Parachute Infantry Regiment, 101st Airborne Division, US Army. They came together, citizen soldiers, in the summer of 1942, drawn to Airborne by the $50 monthly bonus and a desire to be better than the other guy. And at its peak—in Holland and the Ardennes—Easy Company was as good a rifle company as any in the world. From the rigorous training in Georgia in 1942 to the disbanding in 1945, Stephen E. Ambrose tells the story of this remarkable company. In combat, the reward for a job well done is the next tough assignment, and as they advanced through Europe, the men of Easy kept getting the tough assignments. They parachuted into France early D-Day morning and knocked out a battery of four 105 mm cannon looking down Utah Beach; they parachuted into Holland during the Arnhem campaign; they were the Battered Bastards of the Bastion of Bastogne, brought in to hold the line, although surrounded, in the Battle of the Bulge; and then they spearheaded the counteroffensive. Finally, they captured Hitler's Bavarian outpost, his Eagle's Nest at Berchtesgaden. They were rough-and-ready guys, battered by the Depression, mistrustful and suspicious. They drank too much French wine, looted too many German cameras and watches, and fought too often with other GIs. But in training and combat they learned selflessness and found the closest brotherhood they ever knew. They discovered that in war, men who loved life would give their lives for them. This is the story of the men who fought, of the martinet they hated who trained them well, and of the captain they loved who led them. E Company was a company of men who went hungry, froze, and died for each other, a company that took 150 percent casualties, a company where the Purple Heart was not a medal—it was a badge of office.